The Pearl MSS-3000 Advanced Marching Hardware Snare Drum Stand is designed by experts in making the world's most reliable percussion hardware with the world's most experienced contemporary marching percussionists. The MSS-3000 features a traveling front leg that allows up to 13 inches of adjustment for placement of the stand in the bleachers or on any unlevel surface and is also fully height adjustable. This ultra-adjustable snare drum stand also allows for tilt and angle adjustments to get the perfect position for your drum each and every time. All adjustments can be made simply either by hand or with a standard drum key. No allen wrench necessary! With the Pearl MSS-3000 your snare drum will simply slide onto the stand using Pearl's CXSA or MXSA snare drum attachments from the CX Airframe Carrier or MX T-Frame Carrier and is cradled by a new lower bumper support for added stability and protection. 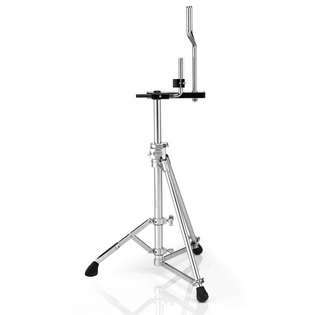 I purchased the Pearl MSS-3000 marching snare drum stand as I was looking for a good quality unit to securely hold my Pearl FFX Championship CarbonPly marching snare. You will not be disappointed with your purchase after buying one of these stands. It is a high quality stand that's very solidly built. The drum position holds steady and there is no tilting or wiggling of any kind. I am completely satisfied with my purchase and Steve Weiss Music shipped it out very quickly which was the icing on the cake! Awesome quality stand, Pearl hardware is what I trust for all my drumming needs. Be sure you have a compatible attachment for your snare drum before buying this! Unlike basket stands, this stand inserts into the harness attachments on your snare drum. I recommend the Pearl CX Snare Carrier Attachment. Installation of the attachment is very easy and only requires a drum key. As for this stand, I've only used it on flat surfaces so far. I haven't tried to tilt the snare yet, although I understand that's a feature of this stand. I actually don't know how the drum is supposed to tilt on it. I still need to figure that part out. As for flat playing, it's sturdy and stable. Again, just make sure you have the attachment for your drum before you buy this! The only reason i give this a 4 is because i would have expected to get the attachment as 'part' of the stand. i think that's only logical for this to be included especially for someone like me who doesnt know anything about this equipment. I orderd the Pearl Drum, carrier and stand for my grandson. How am i suppose to know that the stand would not come with the attachment that is needed for the drum! But it's a very nice, sturdy stand. As far as customer service is concerned-I give Steve Weiss a 5. They shipped my order immediately. It came with no damage what so ever and when i spoke to them on the phone about this issue, they were very friendly and courteous. I will not hesitate to order from them again. Very stable and sturdy. Highly portable. Ultimately adjustable. Worth every penny.